A windy but delightful walk with Nick at Covehithe a week later redeemed my failure to explore the area on the day of my concert. I was introduced to the coastal plant ‘Alexanders’ – a strange name in both its first and last letters (a capital A, and an ‘s’, even in the singular). Nick told me its name, and I told him it was edible, having heard it mentioned in the context of foraging. I couldn’t remember enough about its edibility to suggest picking some; but now, having done my homework, I will certainly not walk past it again without doing so. Our walk was followed by a heavenly vegetable lunch at Darsham Nurseries café, and then we decided on Laxfield for an afternoon church visit, after passing by Nick’s house to pick up my cello. I had driven through the village various times, but it always seemed to be late afternoon or early evening when I had run out of stamina and wanted to get home. It had obviously never made enough impression on me to include it in my day’s plans, probably because it was in the centre of the village and looked large, with a cramped churchyard, none of which qualities particularly attract me. But this is simply because I’ve been spoilt with tiny and remote churches. In the grand scheme of England’s church settings, Laxfield’s is a lovely one, and its interior soon had me feeling ashamed of my prejudices. Here are some cello concerts coming up! Please visit crosswaysfarm.co.uk/suffolk-churches-events/ for the complete list! Tuesday 16th April, 12.30pm. 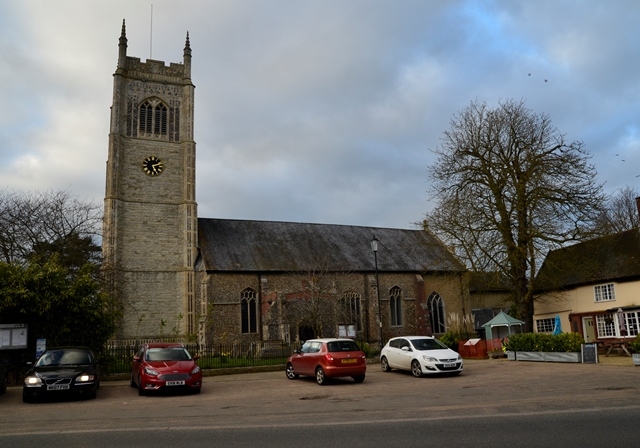 St Mary’s Church, Walsham-le-Willows. Cello recital with James Recknell (piano). Free entry; refreshments provided. Sunday 19th May, 3pm. 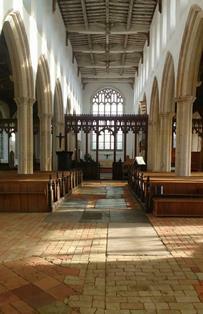 St Mary’s Church, Thornham Parva. Cello concert in memory of Mandy Summers. Yalda & Sheida Davis (cello). Free entry; refreshments provided. After a weekend of rehearsing a challenging cello duet programme, I managed to persuade my sister, Sheida, into a brief stop off on her way home, to play in a church with Steve and me. 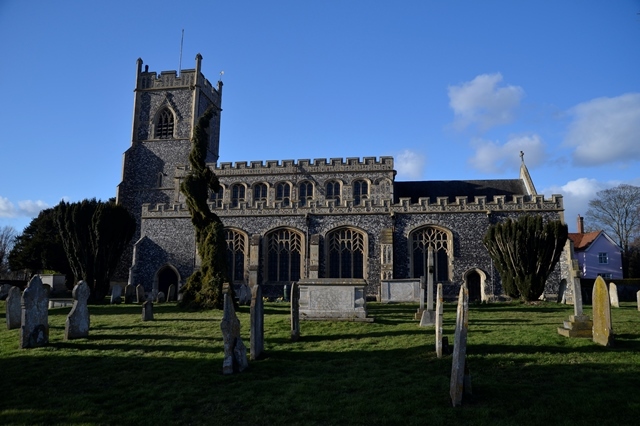 The plan was to meet at East Bergholt, but although I had made sure it was open and there were no services that afternoon, it hadn’t occurred to me to check for events. On arrival, I saw a banner outside the churchyard advertising a concert that day, but it didn’t say at what time. Then I found a message from Steve on my phone saying there was a rehearsal already underway for a concert at 4pm. I was annoyed with myself for the oversight, but at least there was another church close by: Stratford St Mary. Reaching it involved a one-junction run on the A12; and there it was, only a few seconds from the turn-off. Its tower is a Suffolk border landmark, a welcome sight from the main road. But this proximity benefits only the A12, not the church. Still, the fields behind the churchyard and a farm shop and café next door made its location feel more pleasantly rural than it might otherwise have done. 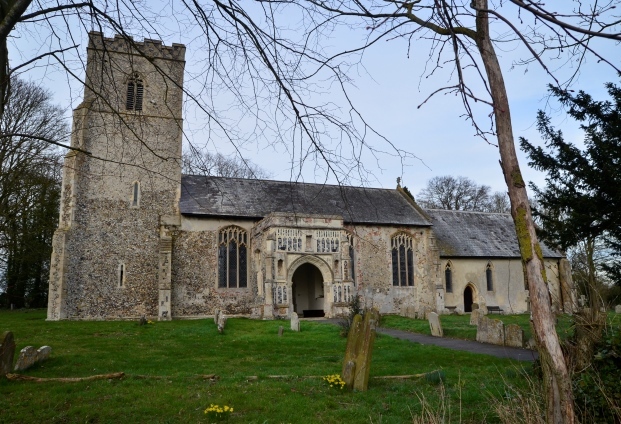 On the first Saturday in March I was due in Covehithe church for an evening concert. For this trip I had a travelling companion – Maureen from Monks Eleigh – whom I had warned in advance that I was planning to visit another church on my way there. Covehithe was nearly as far away from my house as it was possible to get without leaving the county, and I wanted to take advantage of the journey. She wasn’t put off, so we set off together in the middle of the afternoon. It was a glorious February afternoon when Steve and I headed to Woolverstone, the only remaining church for us to visit on the Shotley peninsula. I had forgotten it was in the grounds of Ipswich High School for Girls, and couldn’t quite believe what I saw: it was the estate of a country boarding school, not a day school, and certainly not one bearing the name of Ipswich. A greater contrast to Ipswich School, the other private secondary school in Ipswich itself, was hard to imagine. Mandy’s funeral was fixed for the following week in Darsham church. It wasn’t many weeks since I was there playing in a cello concert she had organised. 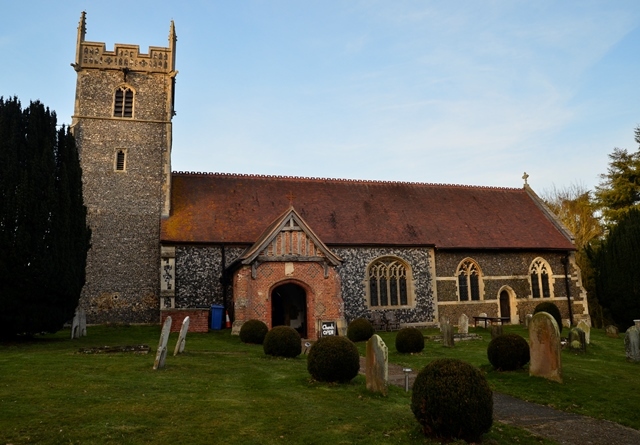 Darsham was just down the road from Westleton, where I was staying, and I thought it would make things easier if I paid the church a visit in advance, to check the acoustic and to have time alone in the space where I would be doing my utmost to play perfectly for her and her family. The following morning was perfect and un-forecast. It was a day for walking in the marshes, and I set off for Blythburgh. Without any thought beforehand as to whether I would go inside the church – I had visited on a few previous occasions, the last accompanied by my cello – I found when I arrived that I had to. It is impossible to walk past such a building. It was no less bright than on the May afternoon of my last visit. I sat down on the step of the font and absorbed my surroundings. This might be the only building I know that the same effect on me as a beautiful outdoor landscape. If any church could make me believe in God, I thought, this was it. I accidentally left my walking boots at Nick’s house, so I went to fetch them the following morning and was easily persuaded to stay for a cup of coffee. I was driving back towards Westleton Heath for a walk afterwards when I saw a sign for Darsham Marshes on my right and changed my mind. It wasn’t a large nature reserve, so my walk was short, but I was glad to discover it. As I was nearing the end of the loop I met a group of three women looking at something on the ground and talking excitedly. I stopped and asked them what they’d found. It was otter poo, they told me. ‘It’s not often one meets people getting excited about poo,’ I said. The lady who had identified the droppings held up a piece and put it under my nose: I was slightly taken aback, unsure how I felt about sniffing poo, and certainly never having had any presented to me at uncomfortably close quarters by a stranger before. ‘They apparently smell of jasmine,’ one of the other ladies explained. I could only detect a very faint fishy odour, but I was amused by the idea. ‘What a very lucky creature to have poo that smells of jasmine,’ I said, feeling our conversation was getting more surreal by the second. I asked where the path led across the boggy ground, said goodbye and continued on my way. I was due at my friend Nick’s house in Sibton Green for lunch, so I looked up churches on near the route from Metfield. 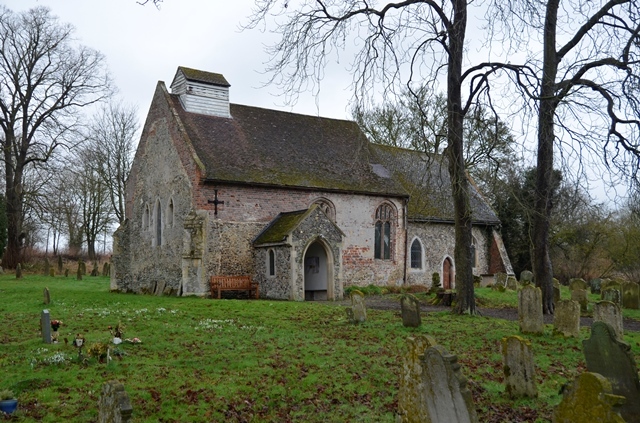 I was surprised to discover that Linstead Magna (‘greater’) church has as good as disappeared, but Linstead Parva (‘lesser’) is alive and well. Their names might have suggested the opposite outcome. But this suited me well: I am always more attracted to smaller places and churches. Pulling up outside Linstead Parva brightened the dreary morning instantly. Only one phrase whirled around in my head as I parked my car and walked up to the churchyard: ‘what a dear little church!’ Simon Knott, I have discovered, also describes it as such, so a dear little church it must be. It reminded me of the diminutive Redisham. 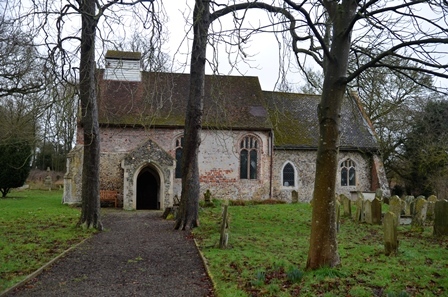 I imagine it must be slightly larger – given Redisham’s supposed (and disputed – by me) status as the smallest church in Suffolk – but it was impossible to tell without seeing them side by side, or at least one straight after the other.